This year we are delighted to present the 3rd Cambridge University Portuguese Speakers Society Wine Tasting event! We will have a large variety of wines from the Douro Valley, including Port, as well as a Portuguese cocktail stand and many traditional Portuguese nibbles. The event will be divided in two sessions: a Workshop, followed by the Wine Tasting. A one-hour workshop led by a guest speaker: Mr. Paulo Osório, MEng, MBA, former Vice President of the Port and Douro Wine Institute (IVDP). 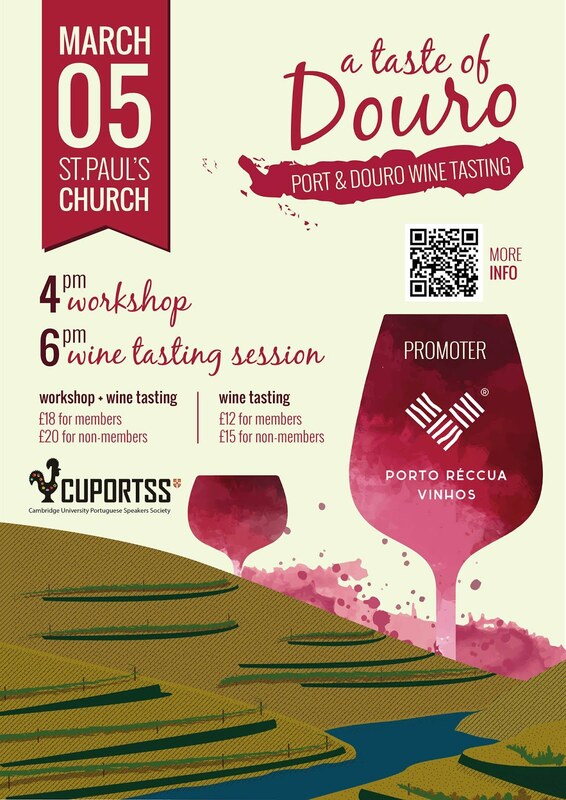 It will include a presentation about the Douro Region and its wines and a tasting session guided by the guest speaker, with a selection of top Port and Douro wines. There will be a limit of 25 participants, with tickets purchased in advance. An open wine tasting session where the participants can taste a wide variety of high quality Port and Douro wines.